The Poem Farm: What to Write? Assign Yourself an Idea and Structure! What to Write? Assign Yourself an Idea and Structure! Students - For this week's poem, I knew that I write a poem following the meter of someone else's poem. But as of yesterday, I had not yet chosen which poem. Nor had I chosen an idea. 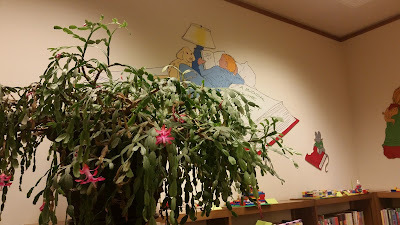 I decided to force myself to find an idea by looking around the Aurora Town Public Library. 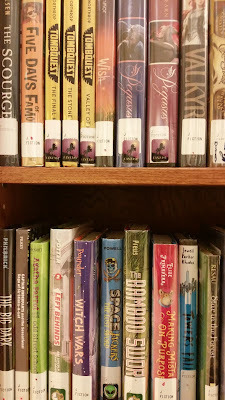 I looked at bookshelves, deciding to write a poem inspired by a book title. I almost did too...I almost wrote a poem inspired by the title MAKING MISTAKES ON PURPOSE. 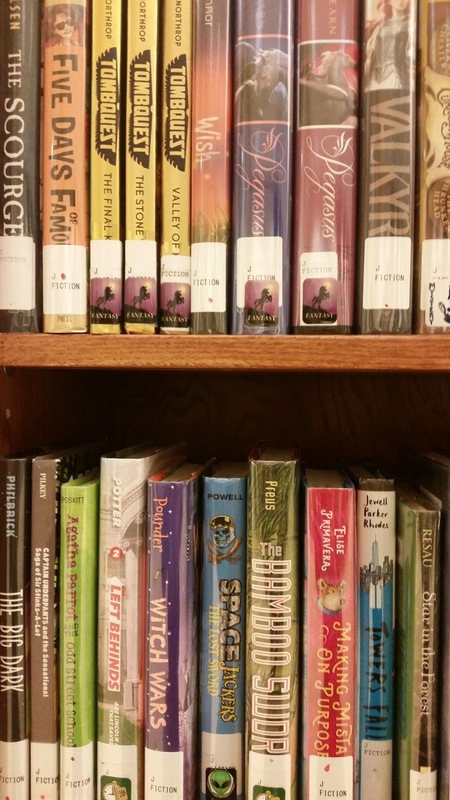 Can you find that book on the shelf below? 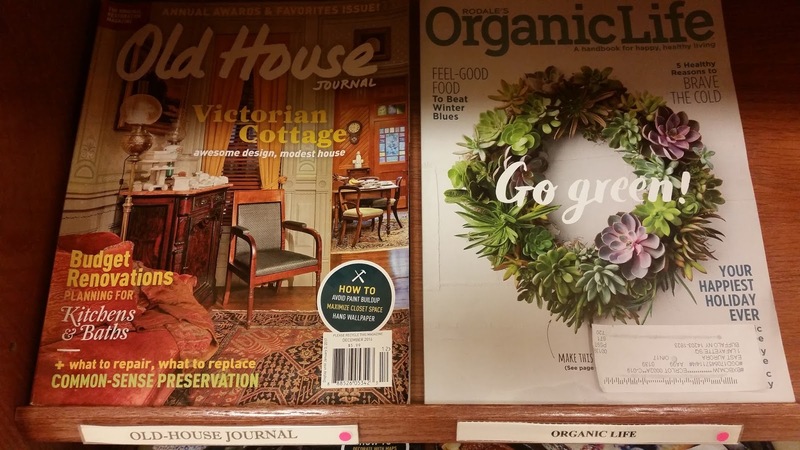 Then I looked at magazines and the succulent wreath caught my eye. 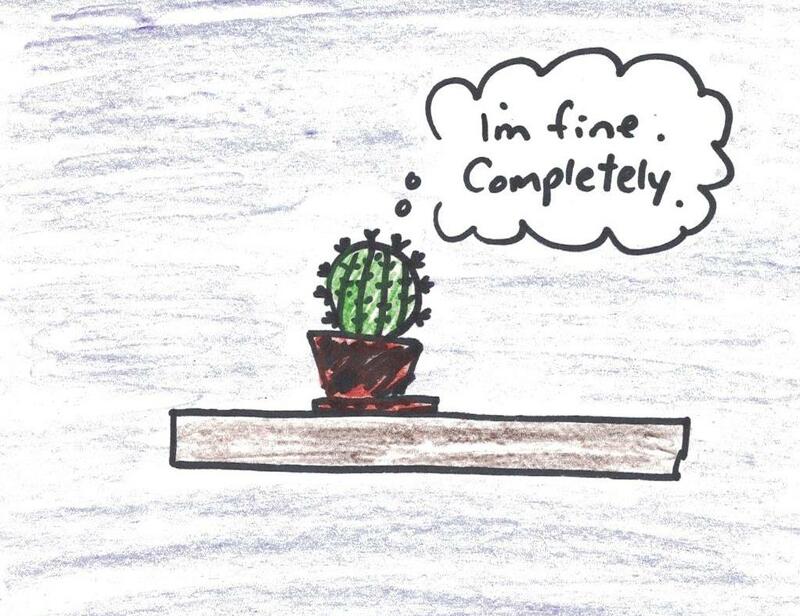 I thought about cacti and how much I admire their toughness. It was just a fleeting thought. 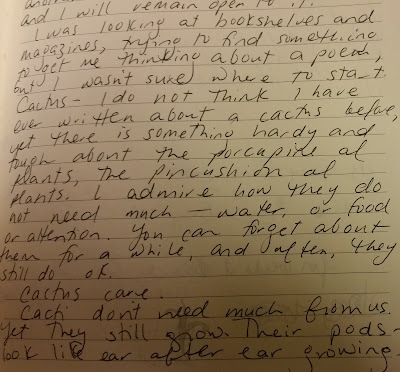 I began freewriting about cacti to get some thinking down in my notebook. Now, I had already assigned myself the task of writing a poem that matched the meter of another poet's poem. 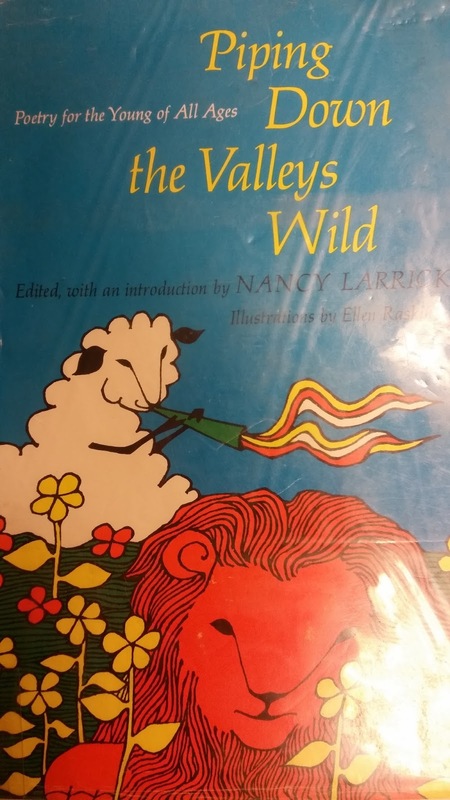 So, I read in this book by Nancy Larrick to choose a meter and rhyme scheme to copy. 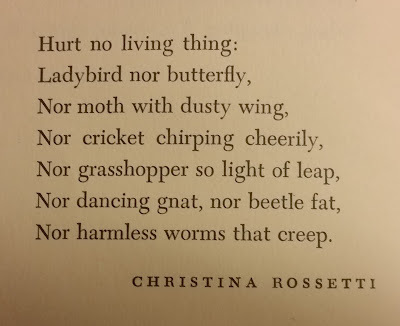 And I decided to imitate the meter and rhyme scheme of a poem I have always loved, the poem by Christina Rossetti that begins "Hurt No Living Thing" - in the public domain. Then it was time to get to work. 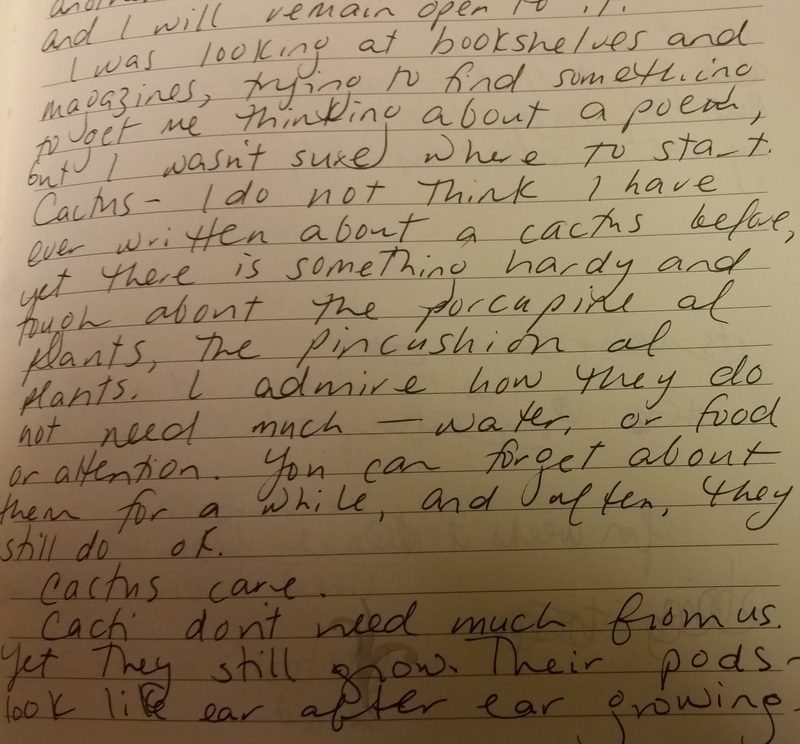 I had given myself an assignment: write a cactus poem in the meter and rhyme scheme of Rossetti's poem. Below you can see some of that work. 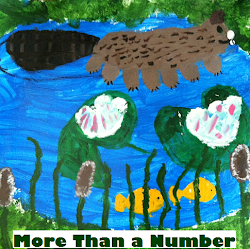 Note the numbers next to my lines - count to see if they match the numbers of syllables in Rossetti's lines. What do you notice about the rhymes in each poem? 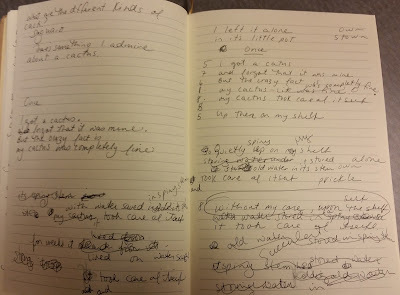 Writing a new piece is a little bit like taking a trip. Part destination, much exploration. You might wish to document the journey of one of your pieces sometime. And if you have never given yourself an assignment, try that too. You might use mine or you might make up something completely new, just for you. The important thing is to follow through. this jade plant, also a succulent. It's funny how once I start thinking about a thing...I see it everywhere! Has this ever happened to you? Congratulations to Linda A. for winning last week's giveaway - a signed copy of FINDING WONDERS by Jeannine Atkins! Linda, please send me an e-mail to amy@amylv.com with your snail mail address, and I will pass it along to Jeannine. Thank you, Jeannine, for the beautiful post and book! 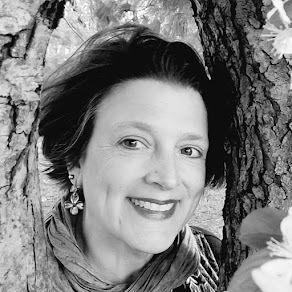 Keri is hosting today's Poetry Friday roundup over at Keri Recommends. 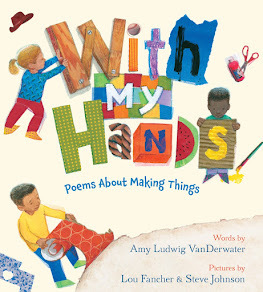 Please visit her place to think about reflection and to learn about what's happening poetry-wise all around the Kidlitosphere this week. ALWAYS I start noticing how much of a thing is happening or how many of those things there are in the world when I focus on one thing for a bit! It was like being pregnant with my first child - suddenly it seemed that everyone I saw was pregnant! Loved your sharing of the process and product here! It's a great exercise. Amy, it's always fun to visit the poem farm. I love the assignment. It makes me want to try that too. Your notebook process is pretty neat. And, I'm so glad you share. Have a great week! I always enjoy reading your explanations and thinking behind each poem. 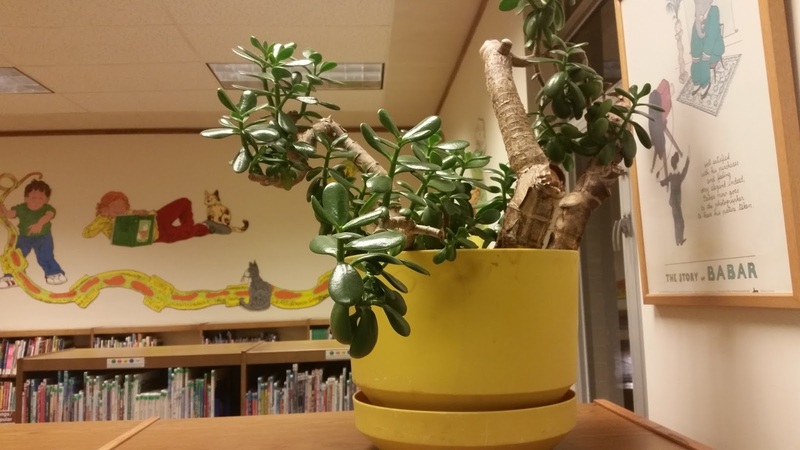 I thought your cacti poem was adorable and familiar and then when you shared the mentor text I could feel it more. I can't wait to show my students. Thank you for sharing your notebook process. 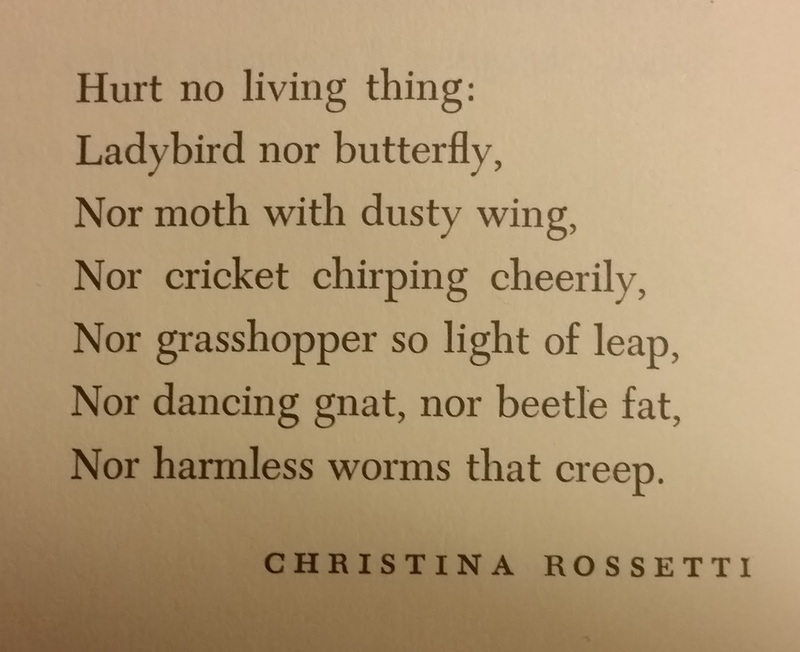 This is something I will share with my students next week - a poet's work comes from so much noticing, doesn't it? I love watching your process unfold, from finding the topic to following the meter to your final poem. I'll be trying this out in my notebook. I enjoyed the poem, and I enjoyed reading about your process even more. Thank you for sharing. Now I'm tempted to find a poem I like and assign myself a topic to write about using its structure. It's always fun to read and "see" your process, Amy. And today fun to see those connections that you missed, like the different kinds of cacti/succulents. Cute ending to your poem! It's so fascinating to see inside your creative process! I'm just a newbie poet (if I can even call myself that), so I'm always curious and ready to learn from others! I am excited about winning a copy of FINDING WONDERS by Jeannine Atkins. Thank you both so much. An email has been sent. 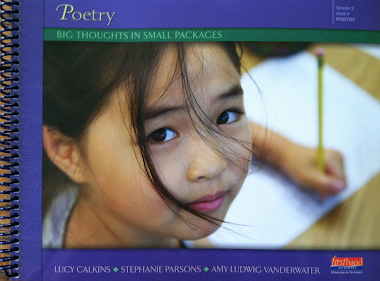 Amy, I enjoyed following your poetry writing process: idea and structure. Fun to watch. I am inspired by you! What a great poem to choose for a model. I've always loved that one, too. I love what you did with your cactus. A cactus is the perfect introvert. 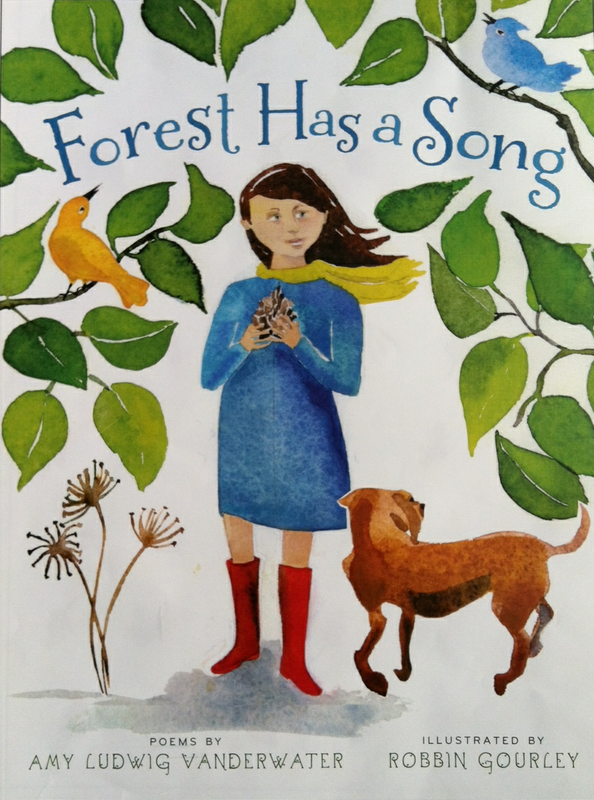 Following the journey from an idea to a poem is fascinating for me and my students. I think I need to get more succulents. I kill everything. Like several others, I am fascinated by "watching" an artist at work. And the idea of giving yourself an assignment intrigues me. It's also surprising to me that you write by hand. I know several other poets that do that as well…I actually bought a notebook because I thought it might be helpful. I love how you invite us into your process. Your poem made me think of how we have lots in reserve. We don't always need to tend or be tended. We have our own internal resources. Here's to tappig into the "water saved". Such serendipity! But not surprising, since libraries are the most magical places on earth. :-) I need to give myself an assignment to explore some new forms! Yes, more self-assignments! I can see three jars: one full of form-type prompts ("write in the rhyme or meter of...") and one full of favorite poems by others ("The Four Friends" by AA Milne) and the last full of subjects ("fruit"). Or a flipbook...nice walk-through of your process!